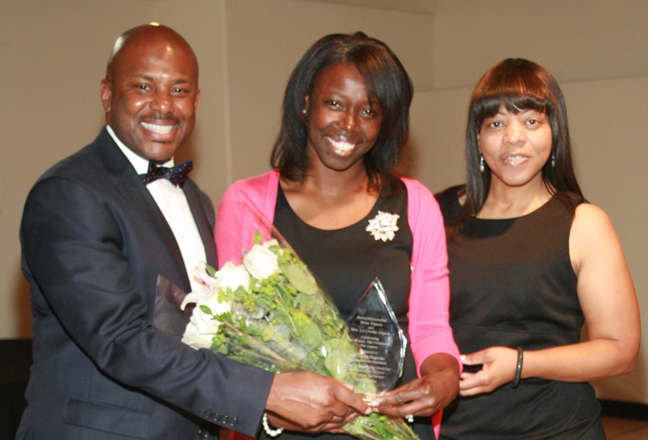 The power couple of Assem­blymember Mike A. Gipson and Mrs. LeCresha Gipson welcomed about 300 guests on Saturday, April 30, 2016 at the Wilmington Senior Center to honor local women for their unselfish commitment to improving the lives of others. Asm. Gipson shared a legislative update before the presentations to the honorees. They included Mattie Adams-Robertson, founding Principal Compton Early College High School and Harbor Teacher Preparation Academy; Raquel Beltran, Associate Director, Pat Brown Institute for Public Affairs; Medel Briggs-Malonson, M.D., M.P.H., M.S.H.S., Medical Director of Quality, Martin Luther King Jr. Community Hospital; Sergeant Krista Crocker, Cali­fornia Highway Patrol; Cynthia Gon­zalez, MPH, PhD., Asst. Professor, College of Science and Health MPH Program in Urban Health and Asst. Director, Division of Community Engagement, Charles R. Drew University of Medicine and Science; Cynthia Hawkins, Hawkins House of Burgers; Irene Huerta, Assistant to President, International Longshore Ware­house Union Local 13; Alma Ortiz, Hojas Premium Tea House; Sergeant Emada Tingirides, Los Angeles Police Department; Bar­bara Torres, President SEIU Local 99; and Marie S. Torres, Senior Vice President of Government Relations and Community Re­search Initiatives, AltaMed. The program was sprinkled with delightful musical selections by the opening group iMusic United and vocalist Donisha Brumfield entertained the guests as roses and engraved diamond keepsakes were distributed by Asm. Gipson. Mrs. Gipson gave the closing remarks, followed by Minister Robin Tucker who ended the breakfast with an inspiring closing prayer. Assemblymember Mike A. Gipson represents the cities and communities of Carson, Compton, Gardena, Harbor Gateway, Lyn­wood, North Long Beach, Rancho Dominguez, South Los Angeles, Torrance, Watts/Willowbrook and Wilmington.